my AFK | Nathan's on a roll with his new job! You are here: HomeStories & NewsNathan’s on a roll with his new job! Nathan's on a roll with his new job! Nathan has successfully completed a work trial at Itsu and secured a permanent work contract! 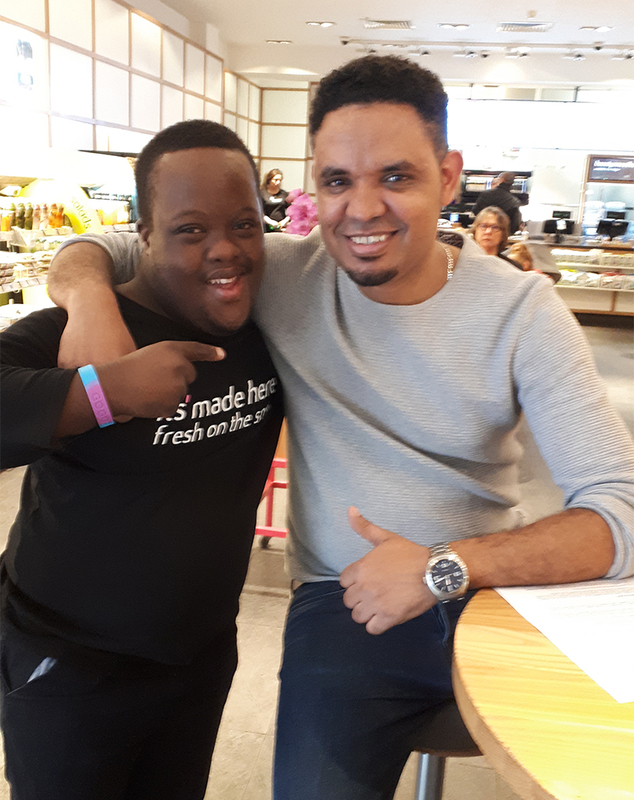 Nathan was 22 when he joined the Life and Work Programme at my AFK in September 2017. He is a characterful young man who has Down Syndrome. He loves football, listening to music and performing in his band. 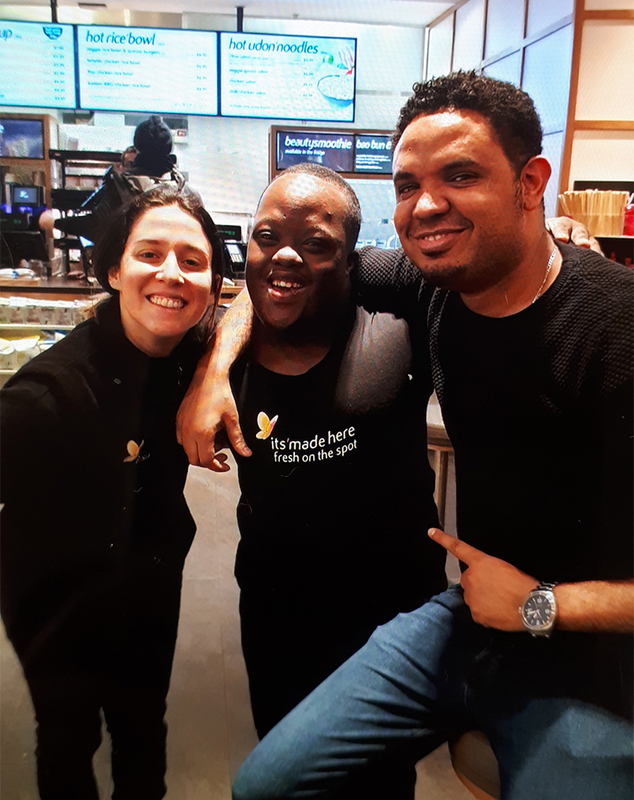 In the spring of 2018, Nathan completed a 13-week employability skills programme provided by the community arm of Arsenal football club, during which Nathan and a group of other young people from various organisations planned and hosted a fundraising event. During the 13 weeks Nathan was successful in getting his idea for a music event chosen by the group. In addition to helping organise and promote the concert, Nathan even performed with his band! When we first met Nathan, he was not a fully independent traveller, and he was accompanied to and from his sessions at my AFK by his support worker. After completing travel training supported by my AFK, his confidence on public transport had greatly improved. 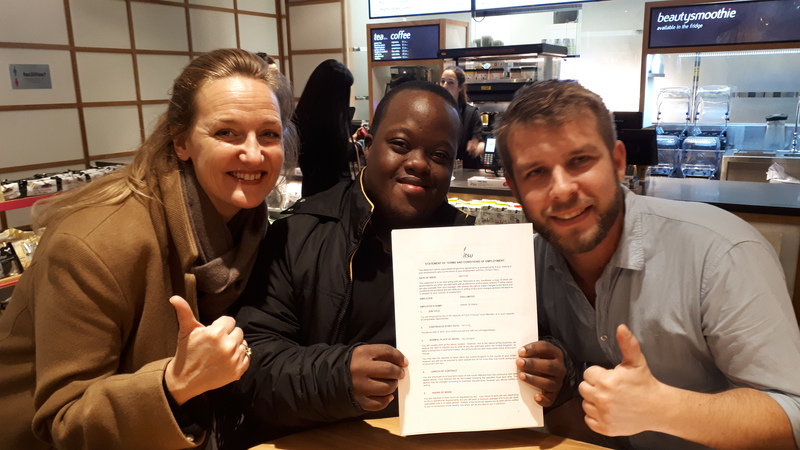 The Life and Work team also arranged other opportunities for Nathan to hone his employability skills, including a placement at a large software firm. He helped staff facilitate a training event by meeting and greeting participants and assisting with the catering arrangements, and his positive attitude, politeness and enthusiasm was noted by all. In October 2018 Nathan started a paid work trial at Itsu, a chain of Asian-inspired fast food selling sushi, salads, soups and more. This was a complete change to his weekly routine as he was required to work 4 days per week during the busy lunchtime period. His role involved working in front of house, where his duties include collecting trays from customers, emptying the bin and replenishing the stock on the shelves. Nathan was initially supported by a Job Coach and then by one of our volunteers Andy, not just on his placement but travelling to and from work. 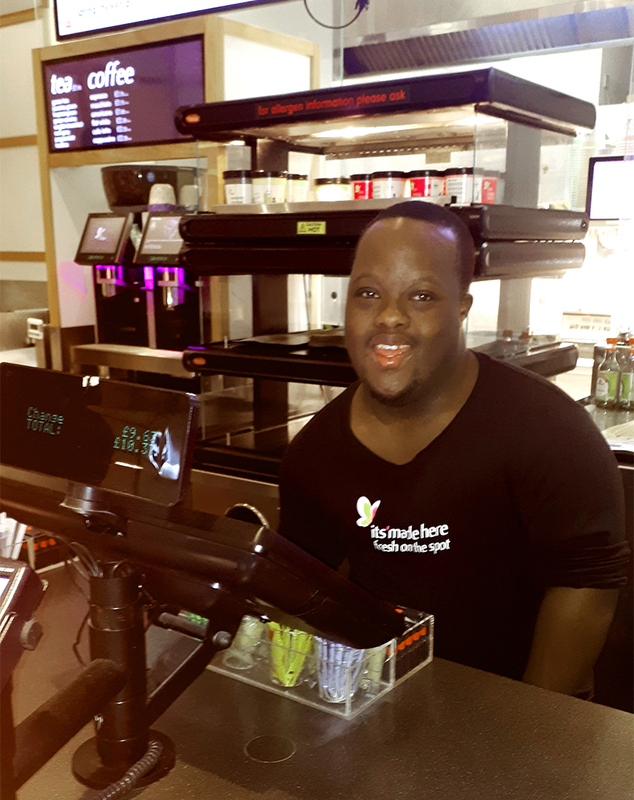 During his work trail, the restaurant manager and the head office at Itsu made a number of reasonable adjustments to the requirements of the role, which allowed Nathan to excel in areas where his strengths could shine, and Nathan proved to be a popular employee with both staff and customers. 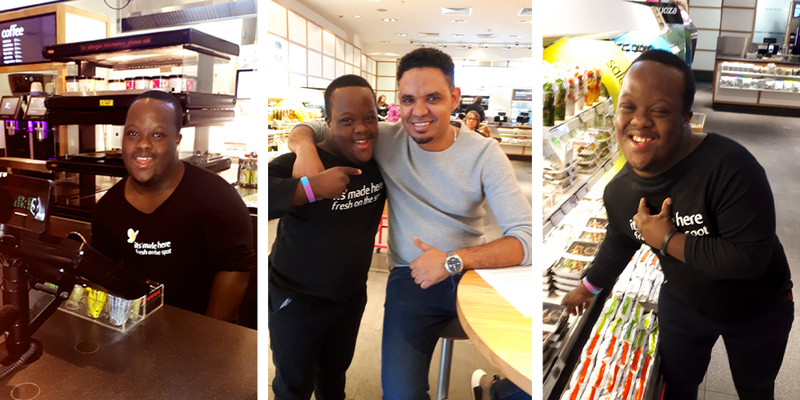 After just two months at Itsu, Nathan was travelling to and from work independently, and after four months Nathan was confirmed in post. 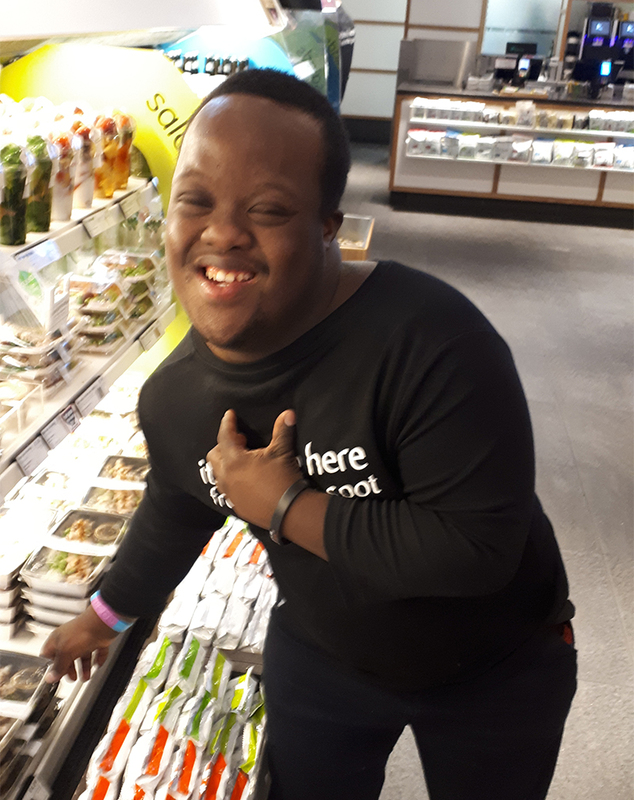 “I feel good helping out customers, I feel happy,” said Nathan, who has progressed to serving customers at the tills, and told us he likes being able to earn his own money.